In the first quarter of 2017, the Port of Hamburg’s total throughput was up by 1.7 percent at 35.4 million tons. Growth in Germany’s largest universal port was therefore slightly above the average 1.6 percent for the other major North Range ports of Rotterdam, Antwerp and Bremen/Bremerhaven. 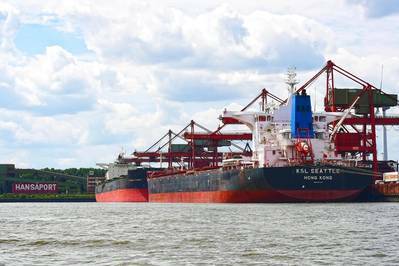 Contributing to the Hamburg total, bulk cargo throughput was 6.7 percent higher at 12.2 million tons, and general cargo handling at 23.1 million tons, just 0.7 percent lower. In the former segment, the 12-million-ton mark was exceeded for the first time, and the best quarterly figure achieved since records began. On the export side, general cargo throughput at 11.9 million tons represented growth of 3.4 percent. At 11.2 million tons, general cargo imports were somewhat lower, being down by 4.7 percent. First-quarter container throughput at 2.2 million TEU was 0.7 percent lower than in the comparable period of the previous year. One outstanding feature of the first quarter of 2017 was the record figure for bulk cargo throughput. ‘Hamburg does not just do containers. At 12.2 million tons, throughput of suction, grab and liquid cargoes achieved 6.7 percent growth.